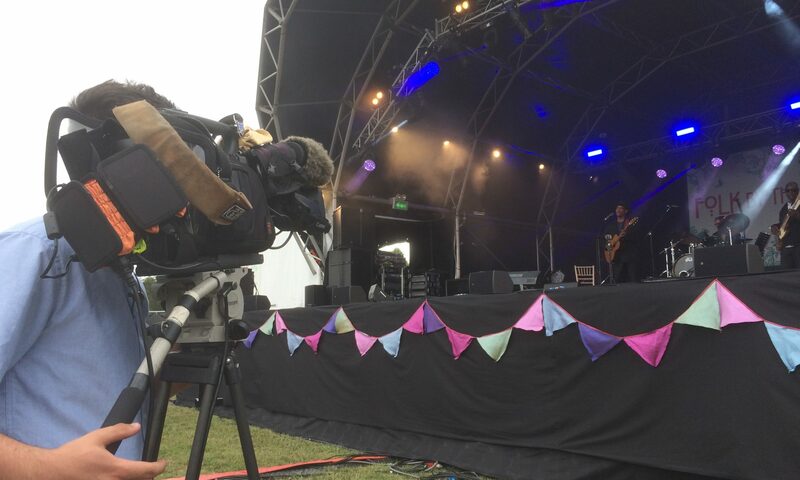 What a season, 5 shows, 10,000 spectators at each, over 2km of cable, 15 cameras, 2 robotic cameras, 25sq m screen, four crew and a musical director…The Battleproms, what a show. Wow what a fabulous first season on this one. Every job throws up its technical challenges, this one was no exception mainly with the distances, cable runs and in one case a lake in the way. The orchestra provided a different set of challenges. We wanted to give the audience a view they’d never experienced before. Up close and personal. By setting HD mini-cams amongst the music stands we were able to achieve this. It has the advantage of keeping camera operators off the stage a little more too. No matter where you put cameras though, understanding what you are filming is key to the success. We have a musical director, Cayenna, for all of our musical LIVE broadcasts. Cayenna’s role is to read the music score, guiding our vision director to give us the key shots as the musicians play. The audience get a first class production, seeing the lead musicians as they hear them, hitting the note with the visuals every time, rather than a reactive production. Minimising our crew levels has always been a priority for us. There is the benefit to the client in cost, and also our own impact on the environment, something we promote as a Social Enterprise built around these goals. What this does however mean is a busy time for the two camera crew on this job. Each operator had multiple camera positions throughout the 7 hour shows. We had deployed additional cable runs into position, allowing them to move cameras and tripods throughout the show, as the action dictated the changes. Bang… the evening gun salute. It catches the best of cameramen each time. The 18 pound First World War Gun really packs a loud punch. Take a look with this short clip. John and his team of gunners have been really helpful over this season, advising on shot locations and camera positioning. Having this relationship has helped to keep our crew safe whilst delivering some new angles, getting better shots than previously experienced at these events.